You like hot pepper sauce? I like hot pepper sauce, do you?... The smell of peppers and imaging what dish will best fit them is always enchanting. I like to experiment with new and original ideas for my recipes. And you? What do you like about hot sauce? How hot is hot for you? What are you favorites ingredients? My homemade hot sauces are much appreciated by family and friends; I would like to share them with you. HotSauceWizard.com was born as a result of that need. Try my recipes and enjoy them! Better yet, may they inspire you to come up with some great recipes to share. Feel free to take a look around. 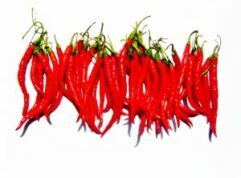 There's a lot of information about hot peppers. You can also download some recipes and share yours.